Dr. John Donald Forde was born on the 9th of November, 1916 in Vegreville, Alberta, Canada. His parents were John William Forde and the former Blanche Atkinson. Around the time of his birth, the Forde family resided on 3rd Ave. E. in Vegreville. According to the 1921 cencus, Dr. Forde was an only child and his father was the principal of the local high school in Camrose, Alberta. Dr. Forde, attended Queen’s University in Kingston, Ontario graduating M.D.,C.M. in 1941. He continued his studies and achieved his L.M.C.C. in 1942. After graduating he started a general medical practice in Fordwich, (Huron County) Ontario and then Hamilton, Ontario. By 1961, Dr. Forde was living at 115 Talbot Street West in Blenheim, Ontario and working at the Ontario Hospital in Cedar Springs. 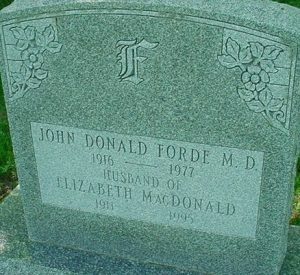 Dr. Forde was married to Elizabeth MacDonald. Mrs. Forde was born on the 25th of July, 1911, in Huron County, Ontario near Kintail. She was the 2nd of 4 children born to Donald A. MacDonald and his wife the former Barbara (McLennan) Cannell . Both of her parents had been married previously and widowed. Her mother had a son named William Clifford Cannell from her previous marriage. Her parents were farmers and besides her brother William her siblings were; Mary, Finlay and Donald. Dr. and Mrs. Forde had 4 children, John Alexander, Marylin, Peter and David. Dr. and Mrs. Forde eventually moved to Goderich, Ontario. In 1977 he was working as a part-time medical consultant for the Bluewater Center For the Developmentally Handicapped. Dr. Forde died on the 18th of May, 1977. Mrs. Forde died in 1995. They are buried at the Lochalsh Cemetery, Ashfield Township, Huron County.